The holidays are just around the corner! It still hasn't really set in to me that it's already the end of November and we're quickly reaching the end of the year. It's just crazy how fast time is going by, it feels like the holiday season was just last week, but in reality, it has already been a whole year. Since it hasn't really set in yet, I figured that it might if I try doing some holiday activities to really get into the holiday spirit. 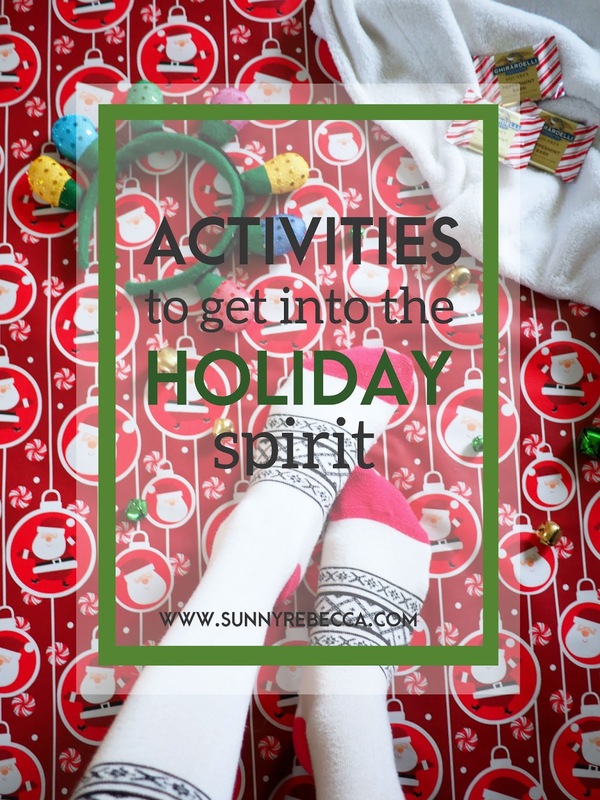 There are so many holiday activities that I want to do during the month of December, and here are a few of them - ones that I want to do and I'm also recommending that you do if you want to try and get into the holiday mood. After all, 'tis the season, right? It's a classic activity for the wintertime, ice skating is so much fun no matter how old you are. Look for a local skating rink near you, the price for open skate is generally pretty cheap, about $10, but if you plan to go into a more populated area, like the city, it might be a bit more pricey. Get your gloves, get your coat, get your fuzzy socks, and head to the rink with some friends and/or family. Ice skating may seem daunting at first if you've never done it before, but you'll get a hang of it fast. It may seem scary to think about slipping and falling, but a) it doesn't actually hurt to much and b) you shouldn't let the fear of falling stop you from having fun with this winter activity. Ahh, the classic and timeless holiday activity. It's so much fun to bake cookies (especially with friends) and decorate them with cute holiday accessories. And let's be real, everyone loves cookies. Although gingerbread cookies may be the staple holiday cookie, you can get creative with your cookie baking and your cookie decorating. Here's an easy (and delicious!) recipe for Nutella filled thumbprint cookies with peppermint topping if you're interested in a different type of cookie than your typical sugar cookie or gingerbread. 'Tis the season for giving, so why not give your time to help out? Look into local charities and/or organizations around you that you can volunteer at. Maybe you can work at a soup kitchen for the day. Maybe you can go to a food bank and help pack food. You can make gift baskets for people that don't have much during the holiday season. Volunteering is not only fantastic for helping to make your community a better place, but it's a fun way for you to spend your time. You can give back to the community during the season of giving and enjoy doing it. Go ugly Christmas sweater shopping. Shopping for ugly Christmas sweaters can be a fun activity itself. It isn't just wearing them that's fun, but it's fun to look for them, scouting out the most outrageous ones. I saw tons of Christmas sweaters at Forever 21, but you can find the original ugly Christmas sweaters at thrift stores. I was at a thrift store a couple months ago and they already had big knit ugly Christmas sweaters for sale. Try on all the ugly Christmas sweaters, just for fun, and then purchase whichever ones that you like best. It's a fun activity and you can take it with you, wearing your ugly Christmas sweater with pride. I LOVE making Christmas cards. I always try and make some original ones for my friends, I like to use colored pencil or acrylic paint in order to make some cards. I love adding some cute puns onto the cards with fun visuals. If you're not super artsy, I posted a blog post last year with a super easy (and totally classy) card design, shown on the right, with the instructions here. All you need is cardstock, twigs (just grab some in your own backyard), a hot glue gun, and a gold sharpie. It's such a fun activity and I love seeing the smiles that people get when they receive a homemade Christmas card. If you want to make it even more of an activity, invite some friends over to make cards. You can pre-cut some cards out of cardstock and everyone can make a few cards. Set out some paints, colored pencils, markers, ribbon, stickers, and more, for a fun day of crafting. The holidays are usually the time to spend with family, but it's still fun to celebrate the holiday with friends. My favorite ideas for a successful Friendsmas might be a dinner party - show off your cooking skills and prepare some fancy dishes, a Christmas movie marathon, gingerbread house decorating, or cooking baking. Friendsmas is the time to go all out with the holiday cheer and really enjoy the holiday. Think "Friendsgiving" but for Christmas! It would be lots of fun to have a Secret Santa or White Elephant gift exchange during Friendsmas as well, because for me, personally, it's so much fun to go gift shopping for others, but it is also just as fun to receive thoughtful or quirky gifts from your friends. What will you be doing to get into the holiday mood? Great ideas girl! My favorite is decorating cookies! It's such a hoilday classic!! I love decorating cookies as well! It's fun and totally delicious!